Everybody is publishing books about small independent magazines these days (or planning to, from what we hear), but books about newspaper and news magazine design are rare. Doesn’t the story go that the printed newspaper is dead anyway? 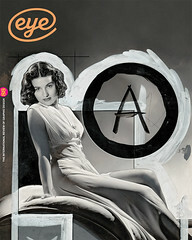 Francesco Franchi, author of Designing News, is the art director of IL, the monthly magazine published by the Italian daily business newspaper Il Sole 24 Ore. For those unfamiliar with it, IL is one of the best-designed contemporary news magazines, with a special emphasis on information graphics. So we are in the hands of somebody whose day job should qualify him to survey the current scene and explore the book’s subtitle Changing the world of editorial design and information graphics. This is a book of two distinct parts: Franchi has written a closely argued text about the current challenges that newspapers face and the new breed of designer (he calls them ‘re-thinkers’) that he believes can help newspapers navigate the future in print and online. Breaking up this narrative is a series of case studies by different expert authors. In many ways the case studies are the more stimulating part, where we read about action rather than theory. They include Mark Porter (see pp.20-25) on The Guardian’s print and digital redesign and the Commercial Type duo of Paul Barnes and Christian Schwartz (see Eye 82) on the development of the Guardian’s typefaces: it’s a well known story but it remains the best and most extensive newspaper redesign project of recent years. Franchi shows his own approach to infographics at IL and, while I am not convinced they are the solution for every story, they look remarkable: a combination of illustration with hard data used boldly across double-page spreads as the central design element across multiple features in every issue. The infographic I really wanted to see was about how many hours these IL pages took to research and draw. Other well chosen case studies reveal different approaches: Steve Duenes, graphics director of The New York Times describes the genesis and teamwork involved in creating ‘Snow Fall’, his paper’s multimedia story of the fatal consequences of an avalanche in the North American mountains and the digital project that has set the standard by which other newspapers measure themselves. In contrast, at The Times in London, Matt Curtis describes his outstanding work on Eureka (the Times’s science magazine) and on the paper’s 2012 Olympic coverage for both print and iPad. Curtis writes: ‘It’s quite exciting having content pouring in and filling in a couple of hours what you have developed for a few months. We would send the second edition before midnight then go to the pub until 3am.’ For all that newspapers and news people are necessarily evolving, this sounds remarkably like the exciting, deadline-addicted Fleet Street of old. 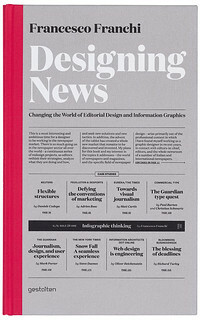 Cover of Designing News, designed by Francesco Franchi and Davide Mottes. 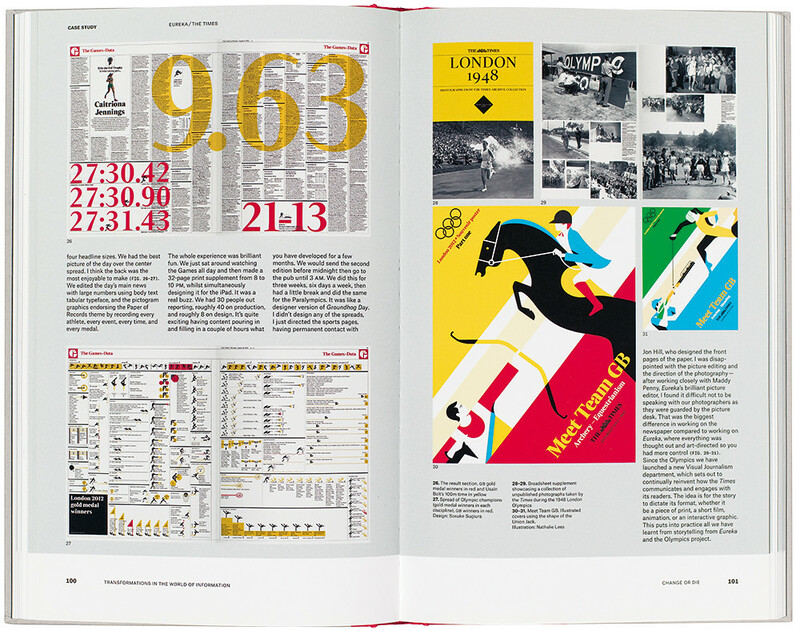 Top: A case study spread featuring images from The Times’s Olympic news sections art directed by Matt Curtis.